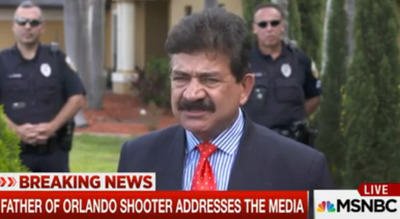 In a bizarre press conference Wednesday, the father of the gunman who killed 49 people at an Orlando nightclub railed against the terrorist group ISIS, saying he too was a victim of the group. Omar Mateen, 29, pledged allegiance to the group, which is also known as the Islamic State, ISIL, or Daesh, amid the attack at the LGBTQ club early Sunday morning. Mateen’s father, Seddique, told reporters at the press conference that he had no idea his son had fallen under the sway of radical Islamism. Seddique, who emigrated to the United States from Afghanistan, implored the US government to destroy ISIS. He also mourned the loss of his son. Seddique has his own strange history. He has said Pakistan’s military-run intelligence agency is the “creator and father of the world’s terrorism.” He is also heavily critical of Afghan President Ashraf Ghani, and he has his own YouTube channel on which he has expressed support for the Afghan Taliban. He recently declared his candidacy for the Afghan presidency.